NETWORK FINALS: SHARK TANK lost 0.1 in final numbers. CABLE HIGHLIGHTS: AMC naturally owned Sunday cable, with THE WALKING DEAD down 0.17 from last week’s midseason premiere to 6.58, and TALKING DEAD down 0.42 to 2.68, with COMIC BOOK MEN down 0.22 to 0.35. 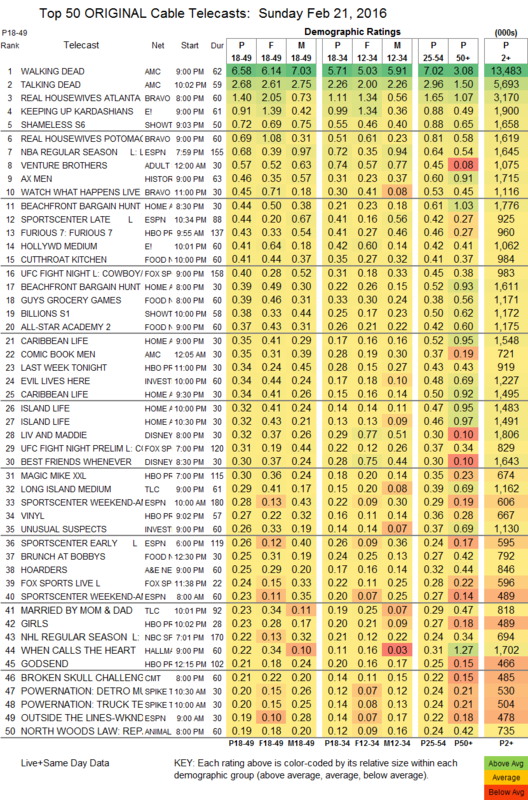 Bravo’s REAL HOUSEWIVES OF ATLANTA jumped 0.36 to 1.40, and REAL HOUSEWIVES OF THE POTOMAC rose a tenth to 0.69. On E!, KEEPING UP WITH THE KARDASHIANS gained 0.09 to 0.91, but HOLLYWOOD MEDIUM fell 0.07 to 0.41. Showtime had no trouble winning the battle of the pay-tv giants, as SHAMELESS climbed 0.12 to 0.72 and BILLIONS was up 0.05 to 0.38, although THE CIRCUS is still lagging, up 0.02 to 0.07. At HBO, VINYL was at least moving in the right direction (however slightly), up 0.02 to 0.27, but it gave no help to the season premiere of GIRLS, which was down 0.16 from the 2015 premiere to 0.23, followed by the season premiere of TOGETHERNESS, down 0.08 from last year’s series premiere to 0.15; as with last week, viewers showed up for LAST WEEK TONIGHT, down 0.02 from last week to 0.34. 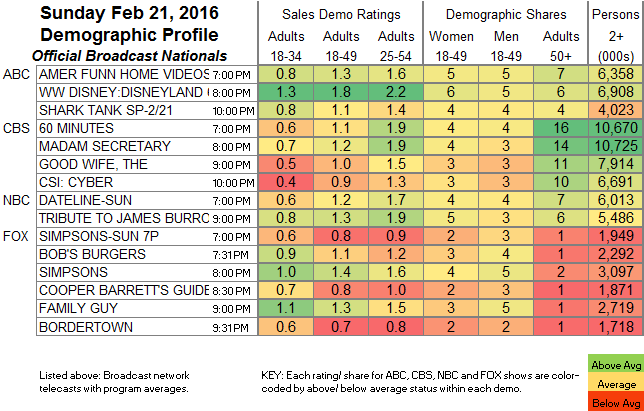 Adult Swim’s VENTURE BROTHERS was down 0.08 to 0.57. On History, AX MEN gained 0.08 to 0.46. On Food Network, CUTTHROAT KITCHEN rose 0.12 to 0.41, GUY’S GROCERY GAMES was down 0.03 to 0.39, and ALL-STAR ACADEMY was up 0.05 to 0.37. TLC’s LONG ISLAND MEDIUM ticked down to 0.39, and MARRIED BY MOM & DAD gained 0.04 to 0.23. A&E’s HOARDERS was at 0.25.